Homeland Fascism, November 25, 2002 – ???? “The soul is the perceiver and revealer of truth. We know truth when we see it, let skeptic and scoffer say what they choose. Foolish people ask you, when you have spoken what they do not wish to hear, ‘How do you know it is truth, and not an error of your own?’ We know truth when we see it, from opinion, as we know when we are awake that we are awake. It was a grand sentence of Emanuel Swedenborg, which would alone indicate the greatness of that man’s perception,–”It is no proof of a man’s understanding to be able to affirm whatever he pleases; but to be able to discern that what is true is true, and that what is false is false,–this is the mark and character of intelligence.” In the book I read, the good thought returns to me, as every truth will, the image of the whole soul. To the bad thought which I find in it, the same soul becomes a discerning, separating sword, and lops it away. We are wiser than we know.” – Ralph Waldo Emerson, The Oversoul. The threat that most unsettles the criminal U.S. ruling class is not the threat of Iran or the threat of terrorism, but the threat of a second American revolution, triggered by the political awakening of the American people. The scale of America’s political awakening and mankind’s political awakening is too demographically large and geographically widespreadto manage, ignore, or suppress with traditional methods of control such as propaganda and the political manipulation of elections. The incredible rise of Ron Paul’s popularity despite the media conspiracy against him as well as the growing influence of the global alternative media are proof that the American mass media has become an ineffective mind control tool. 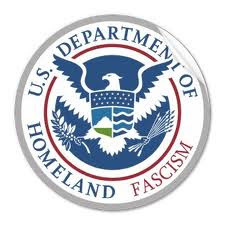 The murderous and traitorous owners of Homeland Security Fascism who staged the tragic 9/11 events know very well that the political awakening of the American people represents the biggest threat to their existence. The growing public awareness of deceptions and crimes by the bankster dominated U.S. government is causing a volcanic political and psychological rift between the American people and the globalist oligarchs. The rift is exposing a systemic crisis within American society, which has come about after decades of acts of injustice, murder, treason, and state terrorism against the American people by the hijacked American government. There’s no way to put the genie of revolution and restoration back in the bottle of stability and security. The U.S. ruling class cannot crush and kill the rebirth of the American spirit of liberty because the people are wide awake now, unlike in the 1960s when JFK, RFK, and MLK were taken from America by the terrorists in the CIA/FBI. But the cannibalistic U.S. ruling class is not impotent and weak. It is trying everything in its power to revive the credibility of the war on terror, convince the American people that conspiracy theorists are wrong, and keep their illegal monopoly over money creation, the media, and the political process. The banking oligarchs and war lobbies think they can secure their control over the domestic agenda in America as well as the global agenda by engineering a war with Iran through false flag terrorism. Iran has nothing to gain and everything to lose by attacking the United States. US policy makers have expressed a documented desire to provoke the Iranians into a war the Islamic Republic is clearly trying to avoid. The United States government is on record funding, arming, and training terrorist organizations (LIFG & MEK) on it’s own “foreign terrorist organization” list,a violation of their own anti-terrorism laws. They have failed categorically to provide convincing evidence regarding the alleged “Iranian-Saudi assassination plot,” more over, the evidence suggests it is instead, the latest in a long string of contrived federal entrapment cases. If an attack occurs on US soil or against US allies in the near future under these circumstances, it is most likely Clapper, General Petraeus at the CIA, and Israel’s Mossad that will be to blame. Others in the global alternative media have raised similar red flags,thereby letting the war criminals in Washington and Tel Aviv know that they are on notice. Officialdom in the United States and Israel have issued a warning about an Iranian “threat stream” against Israeli “soft targets” in America. “We predict that the threat on our sites around the world will increase… on both our guarded sites and ‘soft’ sites,” states a letter sent out by the head of security for the Israeli Consul General for the Mid-Atlantic States. Guarded sites are Israeli government facilities like embassies while soft sites are Jewish synagogues, schools, and community centers. Yoram Cohen, the head of Israel’s security service Shin Bet, said recently that Iran’s Revolutionary Guard will attack Israeli and Jewish targets abroad in response to the assassination of Iranian nuclear scientists. The intensifying rhetoric of war from Washington and Tel Aviv is based on pure paranoia and propaganda and driven by a desire to wipe Iran off of the Middle Eastern map. All the talk from Israel about the Iranian threat to its existence and security is a clever attempt to hide the reality that it is actually Israel and the United States that are waging war against Iran.